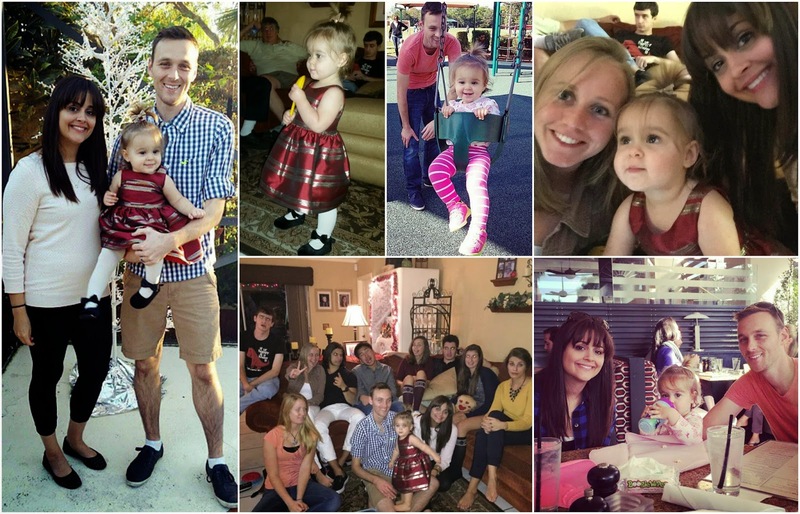 This is a random assortment of photos to recap our Thanksgiving trip. Maybe it's because my main mission was to capture a non-blurry picture of Ella in her pretty dress? No joke, I sat down for a good ten minutes last night and just deleted tons of photos which were complete duds. As I was putting this collage together I couldn't help but notice how much I didn't capture! Note to self...next time be the girl who is constantly making people stop to say "cheese"! Good thing my cousin got this fun group shot of all the "kids" (quotes because Stephen and I are old). I love this picture because half of us were serious, and the rest of us still thought we were supposed to be making funny faces. We just got home last night. It was a quick but fun trip full of new memories. All kinds of "Thanksgiving-y" yuminess was consumed. Ella had a blast eating up all the extra attention (the video won't embed in this post...so you can watch it here). Can't you tell she was in her element? Hopefully you all had a great holiday as well! Now on to the next one...it's beginning to look a lot like you know what around here!